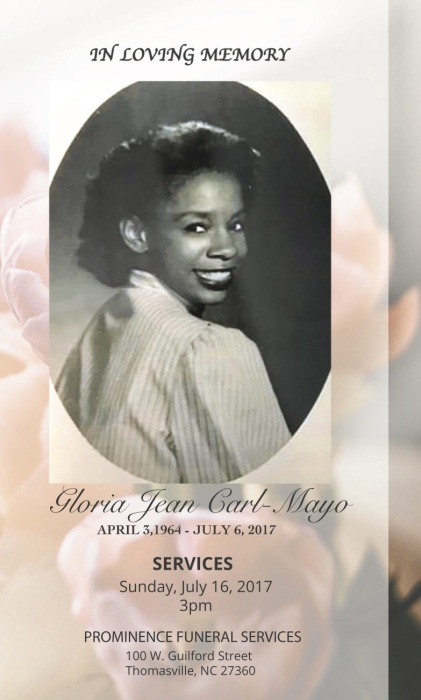 On April 3, 1964, Gloria Jean Carl-Mayo was born in Norwalk, CT. She was the youngest daughter to the late Raymond Carl Sr. and Betty Carl of Greensboro, NC. She left this earth on July 6, 2017. 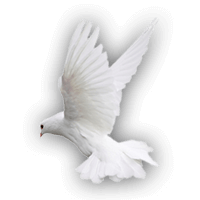 Gloria leaves behind a loving husband and soulmate of 35 years Anthony "Tony" Mayo of Thomasville, NC; mother Betty Carl of Greensboro, two adoring sisters Ramona Carl and Rosemarie Mayo of Greensboro, uncle John Henry Walker of Thomasville, NC, Aunt Terri Smith of Bridgeport, CT; stepson Tashawn Heath of Waterbury, CT; stepdaughter Hasondra Heath of Greenville, NC; nephews Rashad Carl and Shane Mayo of Danbury, CT; youngest nephew and only niece Anthony and Crystal of Greensboro and a host of other relatives and friends.